In a majority of cases, hearing loss is a gradual process; signs can be rather subtle in its early stages, to the extent that an individual may not even be aware that their hearing is changing. They might simply become accustomed to these changes at a subconscious level, in much the same way that people wearing the same pair of eyeglasses for several years believe that their vision has also remained the same – until they eventually go for an eye test and learn that their prescription has in fact changed considerably. Fortunately, in approximately 90% of the cases, hearing loss can be treated with the use of hearing aids. Unfortunately, delaying treatment in instances of suspected hearing loss will not only impact the quality of life for the individual but can/will also have a negative effect on the people with whom they interact, including family, friends, customers, etc. 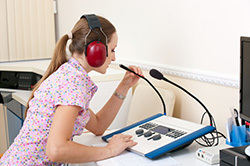 Therefore, if there are suspicions of hearing loss, either through self-awareness or based on the observations of others, it is strongly recommended to seek treatment as soon as possible from a professional hearing centre – one such option is Bravo Hearing Centre in Toronto. 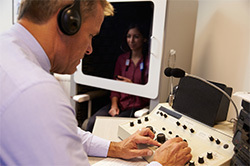 A hearing specialist at Bravo Hearing Centre can conduct an assessment, likely to include a complimentary hearing test, to determine the cause of the hearing loss, as well as its degree, and subsequently recommend the best course of action/treatment, including the probability and benefits of hearing aid use. As noted above, a significant majority of situations involving hearing loss can be treated through the use of hearing aids. In such instances, an experienced hearing specialist from Bravo Hearing Centre in Toronto can suggest, design, and fit the particular hearing aid make and model that best suits the needs and lifestyle of the individual patient. For further information on the complete range of products and services provided by the specialists at Bravo Hearing Centre, see our Services Page. If you or a family member suspect that you may be experiencing some degree of hearing loss, you should seek treatment as soon as possible. Call the hearing specialists from Bravo Hearing Centre at 416-207-9711 to arrange a free hearing test and consultation at your earliest convenience. In a majority of cases, hearing loss is a gradual process; signs can be rather subtle in its early stages, to the extent that an individual may not even be aware that their hearing is changing.